#leadershiptruth - Authenticity is overrated. 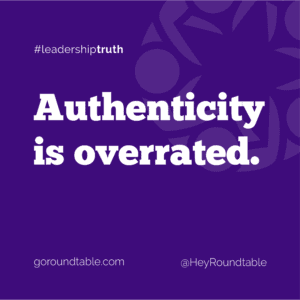 #leadershiptruth – Authenticity is overrated. Most of the people I work with want to be ‘authentic’ when it comes to being at work. I think this is a misguided notion. See, your company hired you to complete certain tasks for them in a certain way. In other words, they hired you for both WHAT you do and also HOW you do it. For example, colourful language may be part of your ‘authentic’ self and perhaps you’ve embraced to drop an f-bomb like a pro as part of your ‘straight shooting’ brand (yes, I’m looking at you, Gary Vee). Cool. But does this mean it’s a good idea for your career? Recently I was reminded of this when I gave a talk to some senior managers. Somewhere along the way in my talk, an f-bomb snuck out. My client gently informed me afterward that this was not in keeping with their company culture. So, as someone who’s brand is known for being a bit irreverent and straight talking, am I being inauthentic if I don’t swear or am I delivering on what my client has asked (and paid) for? When you’re self-employed it’s very black and white. My first priority is to deliver on what my client is paying me for. Well, I think it’s the same when you’re an employee. Companies hire you not just for WHAT you have to do but also for HOW you have to do it. If something feels so inauthentic to you that you can’t tolerate it, then maybe that workplace simply isn’t a fit for you. If swearing was something that I really felt I needed to do then I’d keep on swearing and I’d recognize that certain clients wouldn’t hire me as a result. If your authentic self isn’t fitting with what your employer wants from you, then you have two choices: flex your style or move on. Being a professional isn’t inauthentic. It’s a smart career move.